Mitrefinch, the software specialist, has launched a new office in Nottingham. The news comes alongside significant growth for Mitrefinch and provides the opportunity to tap into fresh talent to help evolve their HR software development offering. 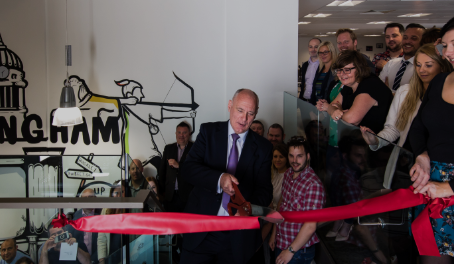 Ken Pullar, CEO of the CIPP, joined Mitrefinch for the launch of the office to cut the ceremonial ribbon. He spoke at the ceremony, sharing his vision for the payroll industry and its potential future. Matthew Jenkins, CEO of Mitrefinch said: “With over 4000 customers globally, we are fully committed to delivering solutions that make a significant impact in the workplace, delivering value and driving operational efficiency. The space was designed and project managed by Mitrefinch’s Jess Baxter and was specifically designed with employees in mind with innovation at the centre. The office was developed to bring an environment that encourages teams to be creative, work collaboratively and inspire innovation. With the addition of beach huts as meeting rooms and ping pong tables, the space takes a fresh look on how to improve employee experience. Throughout the project, the staff at Mitrefinch’s ideas directed the creative process. The vision for the Nottingham office was to support local businesses and give back into the community they are joining. One of their local partnerships include Radiant Cleaners, a cleaning company that give opportunities to people many of whom face significant barriers to employment including people with a history of homelessness and those who have recently left prison. Radiant Cleaners aim to eradicate poverty and unemployment in Nottingham, and Mitrefinch are proud to be partnered with them.